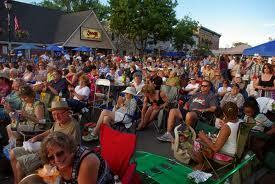 Labor Day Jazz & Blues fests coast-to-coast; how many listening? Jazz and blues festivals occur in America coast-to-coast over Labor Day weekend — how many listeners will the music engage? Capacities vary: free multi-day fests in Chicago and Detroit attract tens of thousands each, and the free Memphis Music & Heritage Festival; River Front Jazz Fest in Stevens Point, Wisconsin; Franklin Jazz Festival outside Nashville, Tennessee; Big Muddy Blues Festival at Laclede’s Landing near St. Louis’ Gateway Arch, and 23rd Annual DC Blues Festival at Rock Creek Park’s Carter Barron Amphitheatre in Washington add many more. A conservative crowd estimate for these seven productions would be, oh, 400,000. There are also specifically promotional events like the Grand Hotel’s Labor Day Jazz Weekend in Mackinac Island, Michigan; the Jazz It Up Wine and Food Festival at Allair Village, New Jersey, and the light outdoor terrace acoustic sets promised by Chaddsford Winery in Chester, Pennsylvania. There may be an Uncommon Jazz Fest in Augusta, Georgia — that’s unconfirmed — but there’s definitely a Curacao North Sea Jazz Festival in the Caribbean. Throw in the Monterey Jazz Festival, Sept. 16 – 18; Indianapolis Jazz Festival, September 17; the first University City Jazz Festival, six miles from St. Louis on September 24. The Angel City Jazz Festival (LA) runs from Sept. 22 through Oct. 2. Total number of attendees for all this music might, I suppose, top 700,000. Points of comparison: The three-day, eight-stage pop-rock fest Lollapalooza held in Chicago in early August sold out 270,000 tickets at $90 per day, $185 and up for the whole thing. Monterey’s one-day tickets this year cost $66 to $132, depending on which day, and that well-established fest typically draws somewhat less than 50,000 people over three days. The two-week Montreal Jazz Festival currently boasts of having a total audience of 2.5 million. Few of these numbers are verifiable — several are based solely on my past experience and informed speculation — so they are of limited value to anyone interested in the size of the jazz audience. Hard quantitative data on the jazz audience is patchy, as the “Literature Review of Research on Jazz Audiences” and other reports from the Jazz Audience Initiative makes clear. Similarly, the National Endowment of the Arts’ 2008 survey of arts participation, which put the percentage of the U.S. adult population that year attending jazz performances at 7.8% (that’s 23.4 million). In a nation of some 300 million people, an audience of even 5 million for live jazz at festivals (and also, one might assume, jazz on radio, tv, cds, the internet, in clubs, etc.) isn’t very impressive. Ok, there isn’t currently a massive consumer base for jazz; we’ve known that a long time. Are people who’d like to see a larger jazz audience going to dwell on the view our numbers are low, or figure a couple of million folks enjoying jazz occasionally — with maybe a third of them doing it all over, in a few days, to celebrate the end of summer — is a good thing? And seize what could be an annual opportunity to invite friends and neighbors, saying “Hey, come join us. The music’s fine and it’s ours”?